Barron Lycett Lycett was commissioned into The Royal Sussex Regiment but was discharged on medical grounds before seeing active service. He later volunteered as an ambulance driver with the French Red Cross, and died of TB in the UK after the war. Barron Lycett Lycett was born on 11 October 1882, at Southport in Lancashire, the fifth of six sons born to John Lycett (1846–1929) and his wife Rosalind Sarah née Rose (1843–1916). Like several of his brothers, Barron was given the name “Lycett” as a second name as well as a surname. John Lycett came from near Stone in Staffordshire and was trained for the priesthood, although it seems that he was never ordained. He and Rosalind were married in December 1875 at Ormskirk in Lancashire (although Rosalind was also born in Staffordshire, the daughter of a barrister), following which he and his family appear to have regularly moved throughout England and Wales. Their first son, Straton was born in Herefordshire in 1877, followed by Bertie at Aberystwyth in 1878, Norman in Hertfordshire in 1879, Graham in Staffordshire in 1881, Barron in Lancashire in 1882 and, finally, Douglas at Liverpool in 1885. In 1891, when they were living at Preston, John gave his occupation as “parish clerk & verger”, but in 1901, when he and Rosalind were living at Strood in Kent, he described himself as a “lay under-preacher”. By 1911, the couple had moved to Westbourne Villas in Hove, Sussex when John described himself as “of private means”. Barron’s brothers Bertie and Norman were both ordained in the Church of England in 1904, Bertie at Cape Town and Norman at Lichfield. Douglas was also ordained at Lichfield, in 1909. On 30 October 1909, at St Peter’s, Eaton Square in London, Barron (aged 27) was married to Mrs. Sarah Adeline Brookes (née Remfry), a 62 year old widow; the service was conducted by Barron’s elder brother, Norman. Sarah’s first husband, Clifford James Brookes J.P., had died in December 1906, leaving an estate valued at £304,500. He had made his money as a merchant in India where the couple had married in 1868; they had three children, two sons and a daughter, born between 1868 and 1875. In 1899, Barron joined the General Post Office at Woodbridge in Suffolk as a “learner” postman. This was a short lived career as at the 1901 census he had moved to Kent (like his parents) and was employed as an assistant school master at a prep school run by Edgar Ledger Mobbs at “Grafton” in Beltinge Road, Herne Bay. The school had 26 boy pupils, aged between 9 and 12, many of whom would die during the First World War. Amongst these was George Frederick Pragnell, who became a Captain in the Queen’s Own (Royal West Kent Regiment) and was killed near Ypres on 23 July 1917. Barron followed his brothers into the priesthood and was ordained as a deacon at Bristol Cathedral on 28 December 1905 and as a priest at Canterbury in 1907. He was appointed curate at St Paul’s in Bedminster, Bristol in December 1905, at St George’s, Ramsgate in 1906 and at St Peter’s, near Broadstairs in Thanet in June 1907. Barron Lycett was one of three brethren who were initiated into Royal Clarence Lodge No 271 at Brighton on 8 December 1913, the others being Alfred John Martineau, a doctor (who was killed in April 1917), and Charles Burt Brill, a solicitor. The three men were passed together to the second degree on 20 February 1914, but raised to the degree of a master mason at successive meetings, starting with Barron Lycett on 20 March. Shortly after the declaration of war, on 6 October 1914, Barron Lycett enlisted at Ashtead, Surrey becoming Private No 2952 in the 21st Service Battalion, the Royal Fusiliers (known as the 4th Public Schools Battalion). On his enlistment papers, he gave his occupation as “none” and he was described as “unmarried”; thus, it would appear that his marriage to Sarah had broken down. 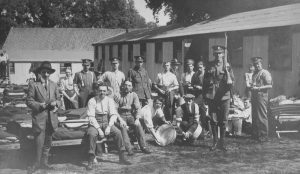 His service with the Royal Fusiliers was based at Woodcote Camp, near Epsom. On 15 June 1915, he was commissioned as a second lieutenant into the 10th (Service) Battalion, The Royal Sussex Regiment. He was immediately sent to the North Lancs Infantry Brigade School of Instruction for Junior Officers, where he was soon declared unfit for military service. On 20 July, he was diagnosed with an “inflamed gland, threatening abscess”, with a recommendation of 21 days sick leave. On 3 August, a medical board examined him and reported that he had contracted syphilis and was suffering from enlarged glands of the left groin. The board considered that, because of infectivity, he should be granted three months sick leave. On 10 August 1915, the commanding officer of his battalion stated that he did not consider that “his retention on the service (was) desirable”, following which Barron was discharged from the army. In 1918, he volunteered to join the French Red Cross and served as an ambulance driver in France from February to August 1918. Barron Lycett died, after a long illness suffering from the effects of exposure to gas in France, on 6 March 1919 at 3 Devonshire Place, Eastbourne; the cause of death was recorded as “Acute Phthisis” (pulmonary tuberculosis). As a result of his service with the French Red Cross, he was awarded the Croix de Guerre with two stars as well as the British War Medal and the Victory Medal. Although he had served in the army in 1914–15, he was not awarded the 1914–15 Star, as he had not served “in a theatre of war”. He was buried in the churchyard at St Peter’s in Thanet where he had been curate in 1907. The funeral service, on 13 March, was conducted by Revd. Harcourt Charles Snowden, whose son, Lieutenant Harcourt John Snowden had been killed at Richebourg-L’Avoue on 11 January 1915 with the 1st Battalion, Hertfordshire Regiment. The mourners at the funeral included his five brothers, while the floral tributes included one from his widow “To my darling Bob, from Adeline, 21 Fourth Avenue, Hove”. He is not recorded by the Commonwealth War Graves Commission, nor does he appear to be commemorated on a war memorial other than the Masonic Roll of Honour. Two of Barron’s brothers were also freemasons. In April 1911, Bertie was initiated into Norwood Lodge No 3149 at Bellevue, Johannesburg in South Africa, but resigned in March 1913. In December 1919, he joined Eliot Lodge No 1164 at St Germans, Cornwall. Norman was initiated into United Industrious Lodge No 31 at Canterbury, Kent in January 1916. During the war, Bertie and Norman both served as Army chaplains, while Graham was a 2nd Lieutenant in the Royal Sussex Regiment. Norman was attached to the 16th Rifle Brigade when he was captured near Saulcourt in the Somme on 22 March 1918 and taken prisoner. He was held in a prisoner of war camp at Karlsruhe and released after the war. Barron’s widow, Sarah, died at her home at Fourth Avenue, Hove on 12 July 1924, leaving an estate valued at £41,700, with her two sons being appointed executors. The National Archives: WO 339/31208 2nd Lieutenant Barron Lycett Lycett. The Royal Sussex Regiment.